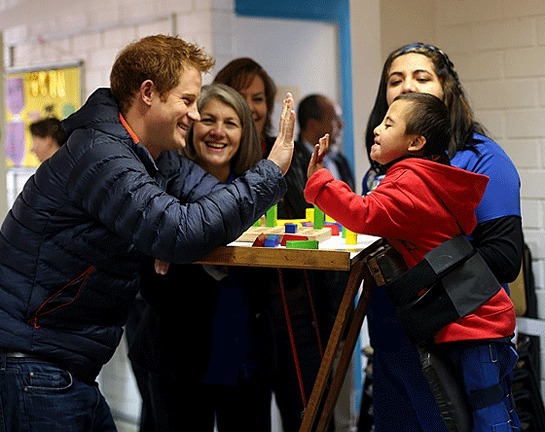 Prince Harry ended his trip to Chile during the weekend by visiting a day centre for children with mental and physical disabilities in Santiago. His Royal Highness spent around 45 minutes sitting, playing and interacting with children with a range of disabilities at the Fundacion Amigos de Jesus. The foundation’s founder Gladis Ramirez, known affectionately as Popa, took the Prince on a tour of the centre which grew out of the needs of a small group of women who, like her, had a disabled child and were frustrated at the lack of services available. The foundation primarily looks after children whose parents work and are unable to take care of them during the day. Popa believes that the people she works for are not disabled, but simply have different skills. The foundation teaches culinary skills to some of the children, and currently runs a small bakery, producing bread and pastries that are sold twice a week in the local market. The British Embassy in Santiago has strong ties with the organisation – members of the Embassy families volunteer there, and Embassy staff recently planted the garden and repainted murals in the centre. Prince Harry made friends with many of the youngsters and visited the dormitory where staff care for children who are confined to bed; the bakery where children were baking muffins and bread, and the garden, where older children were rehearsing a play.